When pasting key frames and exposures, you can modify the existing presets to your liking. There are three presets you can modify: the default presets for both key frames and exposures, key frames only and exposures only. ‣ All to edit the default paste preset settings. 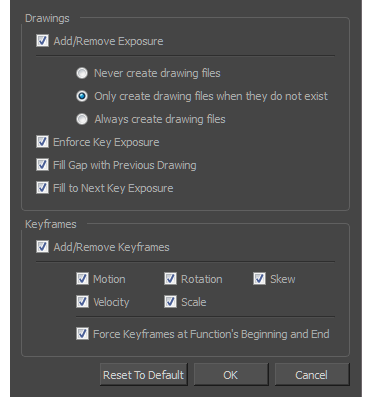 ‣ Key Frame to edit the preset settings for pasting key frames. ‣ Exposure to edit the preset settings for pasting exposures. The Edit Paste Presets dialog box opens. Refer to the following table and edit the presets as desired. Never create drawing files: When adding exposures to a drawing layer, drawing files will not be created. Only create drawing files when they do not exist: When adding exposures to a drawing layer, new drawings will be created only when drawings with the same name do not already exist in the destination. Always create drawing files: When adding exposures to a drawing layer, new drawings will always be created. If drawing files with the same name already exist, Harmony will create a new name for the drawing. If there are key exposures that exist on copied drawings, they are preserved when pasting. No key exposures are added. This is the default behavior when pasting. Fills selected area in the Xsheet or Timeline view with the previous drawing. Fills selected area till the next key exposure. Motion: Copies the properties of the selected motion keyframe to the new frame. Velocity: Copies the properties of the selected velocity keyframe to the new frame. Rotation: Copies the properties of the selected rotation keyframe to the new frame. Scale: Copies the properties of the selected scale keyframe to the new frame. Skew: Copies the properties of the selected skew keyframe to the new frame. Force Keyframes at Function's Beginning and End: Adds a keyframe to the beginning and end of the pasted function, reproducing the source function.